I think of mushrooms as a must-cook food. Sliced raw on salads they taste marginal, at best. And I have a slight paranoia about the ill effects of eating some of the more unusual varieties raw. Morels, for instance, must be cooked (and cooked thoroughly) to avoid “gastrointestinal distress.” Yikes. 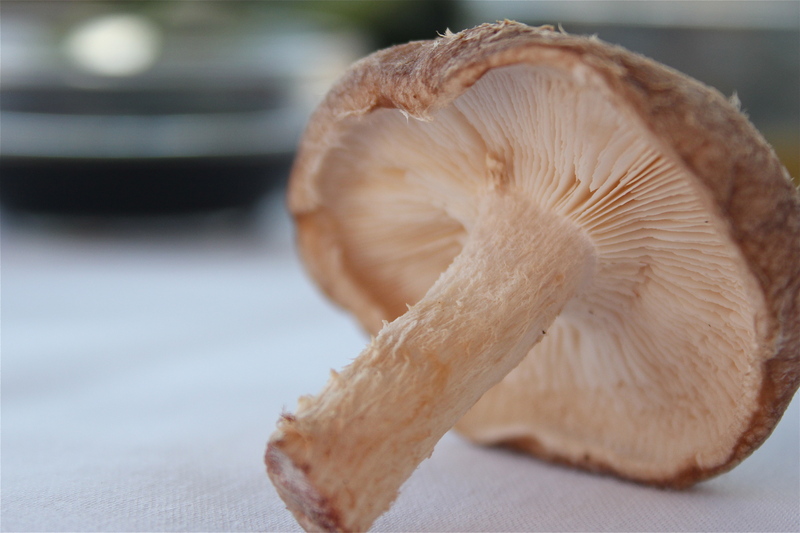 Shiitakes eaten raw can cause, in about 1 in 50 people, an itchy rash on the face and neck (more on this in a minute). But let’s assume we’re not dealing with morels today (we’re not) and that you’re one of the 49. Or that you’re preparing plain old button mushrooms. Try a marinade. Marinating exploits the sponginess of raw mushrooms, a possibility I hadn’t considered before Chie told me about today’s recipe while we were on a walk in the sun the other day. Speaking of which, this week we had a winter tease if I’ve ever seen one. I broke out my sunglasses and Chie and I peeled off our jackets as we were circling the lake. 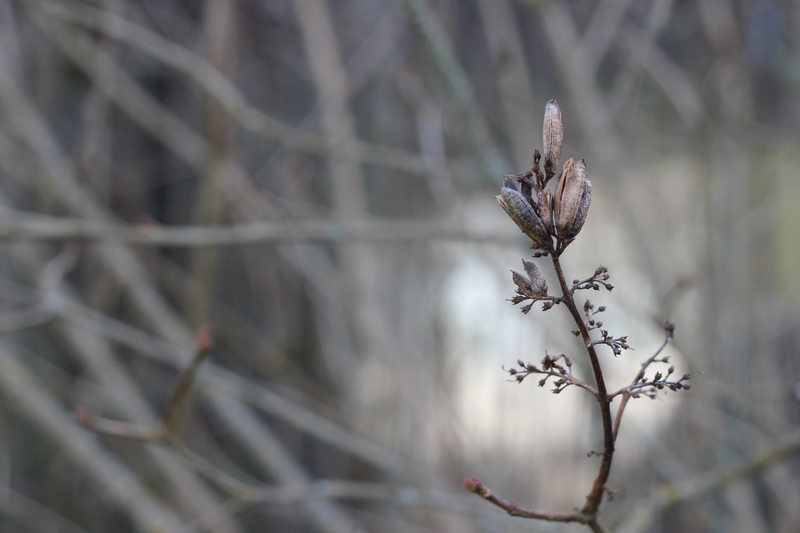 The spring-like weather nudged me to get outside with my camera, too. 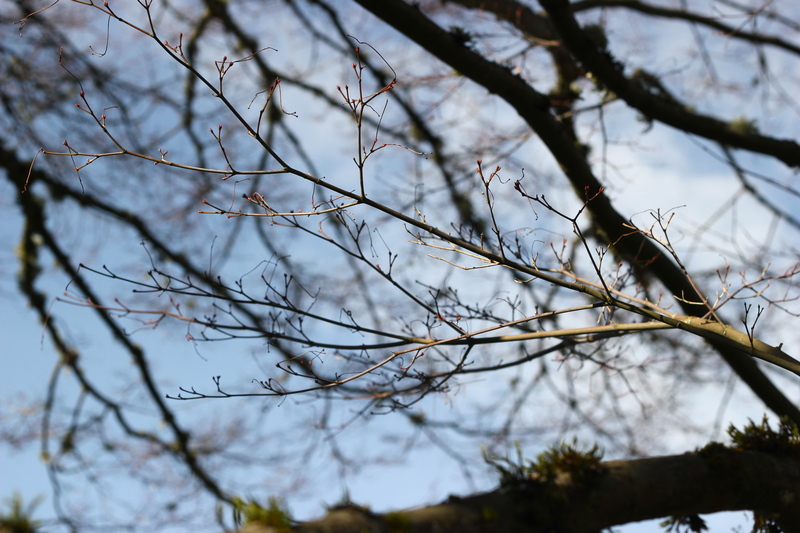 Before I get back to the issue at hand, here are a few images from a practice session with my new lens. 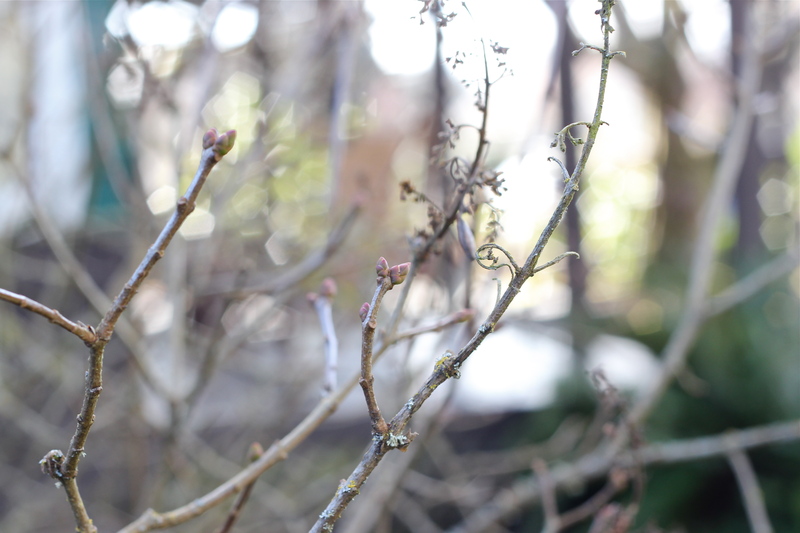 These were taken in our front yard, where the plants seem convinced that it’s both winter and spring. And there’s something else before we move on. I turned 40 this week. It’s strange to witness the softening of my features in the mirror, to discover which edges age is choosing to blur. But mostly I’m okay with the change, even looking forward to a decade my older friends tell me they recall with fondness. I foresee a time of taking better care of myself, risk-taking, acceptance and a richer understanding of people. But enough about me. On to the cooking! Before we move to the recipe, I’ll note that sources I read recommend shiitakes be cooked in order to avoid the possibility of the rash I mentioned a moment ago. 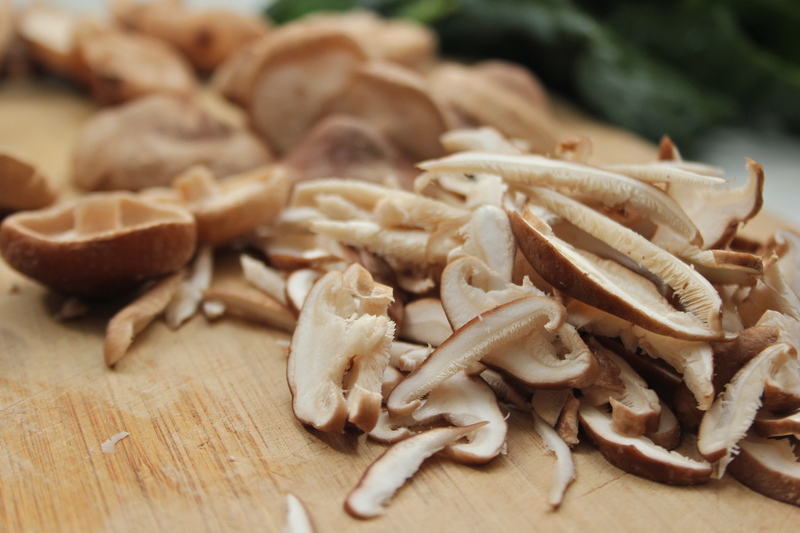 If you’re leery, sauté the mushrooms prior to marinating. That said, I went ahead and marinated them raw. 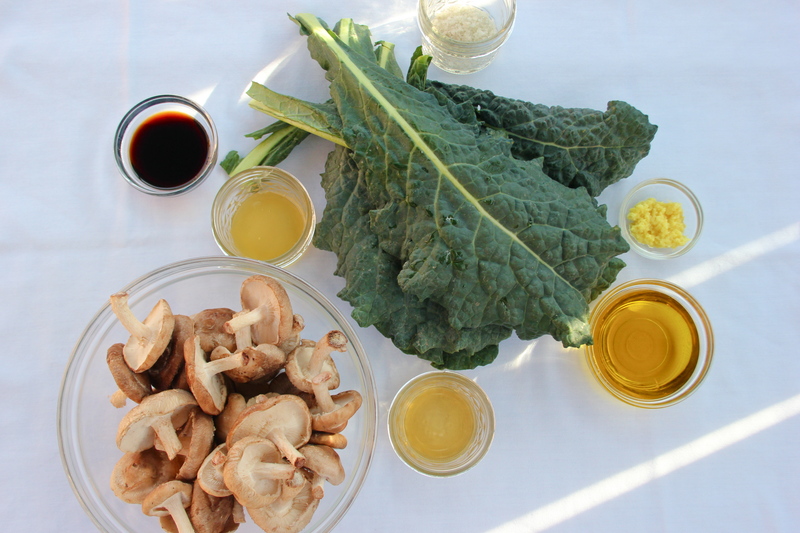 As Chie promised when we talked about it on our sunny walk, they soak up the flavors of the tamari, vinegar and ginger and combine with the blanched kale for a warm salad that is itself somehow a perfect combination of winter and spring. grows these healing fungi, Terry Bunce. This salad was inspired by Joseph at Wobbly Cart Farming Collective. He reminded me of blanching greens to make a simple, delicious, almost creamy dish. Bring a medium pot of water to a boil. Add a small handful of salt. 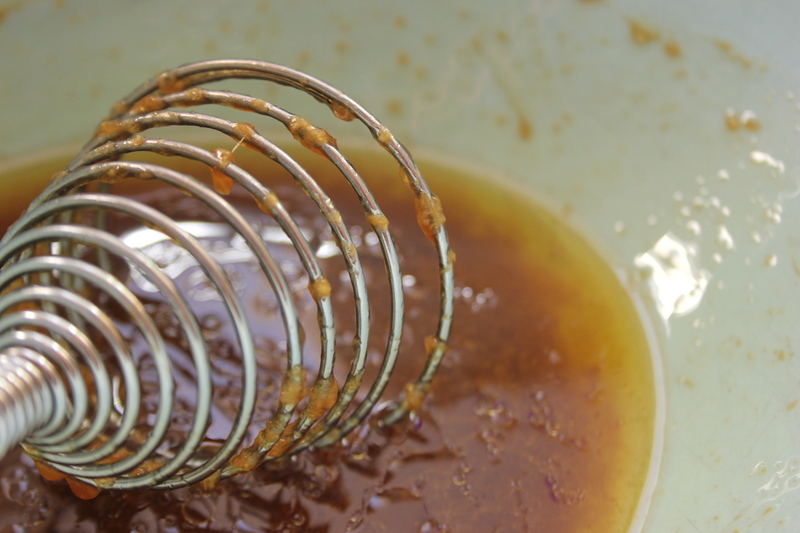 Meanwhile, whisk together the olive oil, tamari, vinegar, ginger and honey. Stem and slice the mushrooms and add to the dressing. Set aside to marinate. for a minute or so, just to wilt the greens. Drain well. Toss with the marinated mushrooms. Adjust for seasonings, serve warm and enjoy. 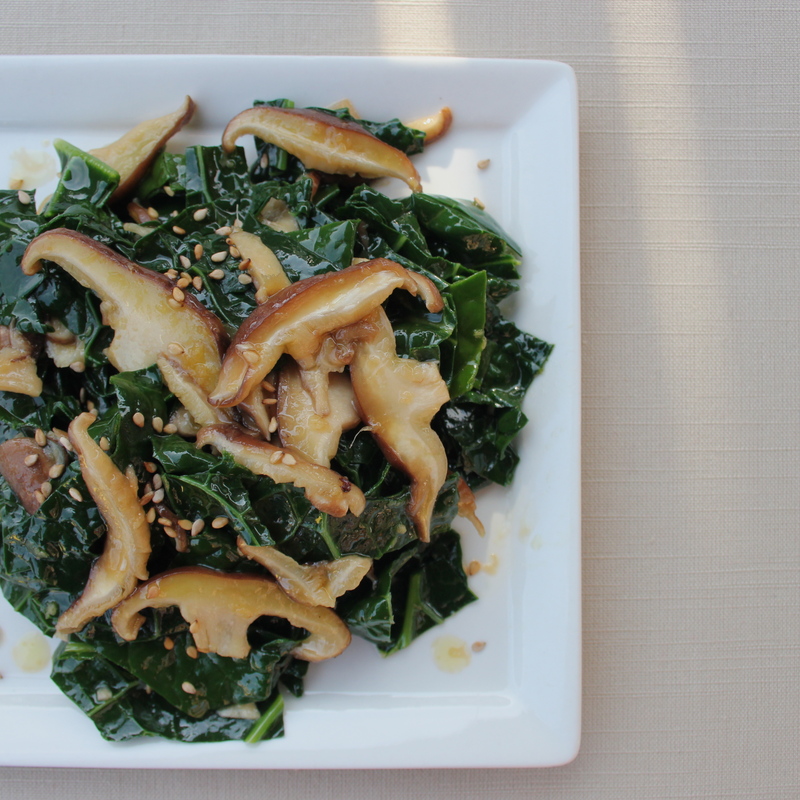 This entry was posted in Recipes, Winter Vegetables and tagged Honey, Kale, Mushroom, Salt. Bookmark the permalink. Looks lovely and made my mouth water. I’d love to try this warm salad. I just bought a fresh bunch of kale and instead of kale chips I’m going to try this beautiful salad. Thanks for the idea! 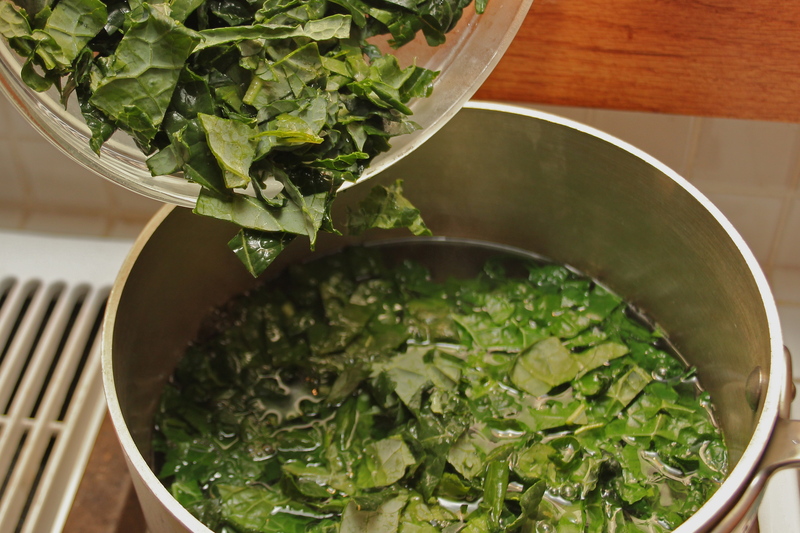 It’s almost as easy to make as kale chips! And Woesha, I hope you do try it. I had to make myself stop eating and save some for my family. I turned 40 a few weeks ago and I’m having some of the same thoughts you are. I’m feeling the confidence of “hitting my stride”. I’ve enjoy your recipes and adore your photography. Your photos are sublime! This recipe is on my “make” list as well! Kirsten, thank you so much for visiting! And you can’t imagine how much I appreciate your kind words about my photography. Feels like I’m on a steep learning curve. Thank you! Please let me know if you give this a try. I’d never made a salad like it before – so simple and nourishing and beautiful, all of the above. And I hope you enjoy your own journey into this next decade. Seems like we’re in for a great ride. Just when I am beginning to fret having run out of ideas in my newfound vegetarianism, you revived my dedication with a yummy new recipe involving the one leafy green I love to hate. Thank you! You are welcome, Clare! And what’s this? No kale for you? I hope this recipe redeems it. I found the leaves to be so tender after blanching. Beautiful pics as usual and the that dressing sounds like a perfect accompaniment to shiitakes and kale. Your photos make me want to eat my laptop screen. Ha! Oh, gosh – thank you, Huy-zer! I love love love Kale and shiitakes. Two of my favorite vegetables that I eat raw or cooked about 4 times a week. Your recipe sounds really good! I am going to try out your recipe in the next few days! I’ll let you know how it turns it out. You take very nice pictures! Happy Belated Birthday! Did you have a chance to try it, 1milagritos? 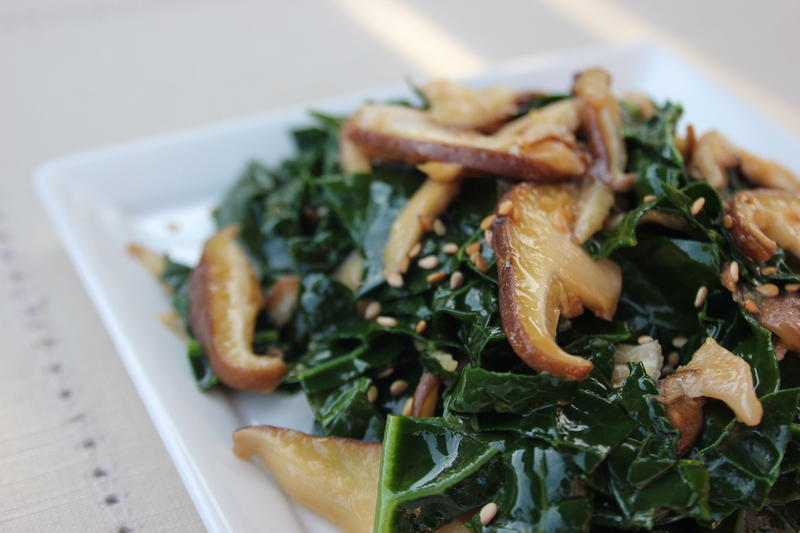 I’d love to hear what you think, especially from such a seasoned kale and shiitake eater! And thank you for the birthday wishes. It’s been a wonderful week. I’m actually going out today to get some tamari sauce. I’m on my own for dinner tonight and was thinking of making this vegetable dish. We have all the other ingredients and I think it will be a nice side dish to go along with my roast chicken (cooked by the market, not me) and brown rice. I promise to let you know how it turns out. awe shiitake! We are out of shiitake mushrooms. The hubs used all of them for last night Vday dinner. So, I will be making your dish tomorrow and the hubs will get to try it too. I finally got around to making this dish and with a few tweaks. It was a success. Even my niece liked it and she doesn’t like vegetables. Originally we found the dressing a bit salty and powerful, so I added a little extra olive oil, honey and a bit of sugar. After the few tweaks, the kale disappeared from everyone’s plate! 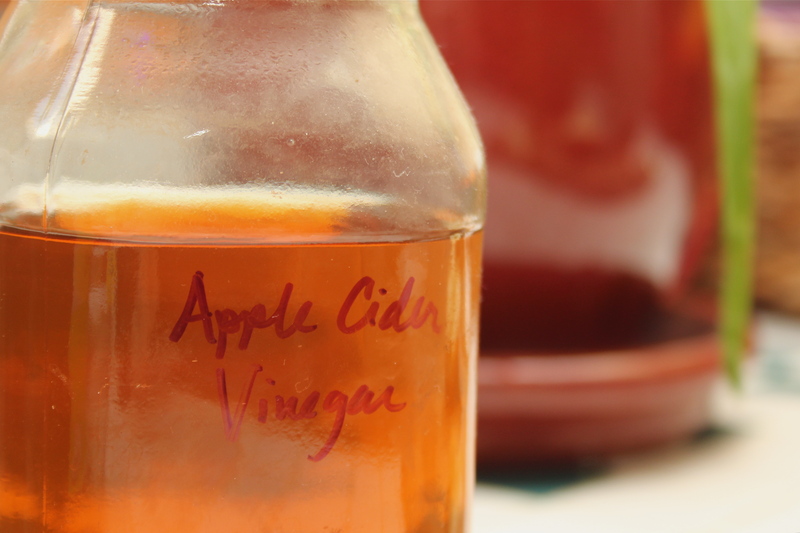 My husband makes a dressing sort of like this with rice wine vinegar so I will try it with that instead of cider vinegar next time. Hooray, a success! I’m so glad it worked out. Adding the extra sweetener is a good idea. Thanks for letting us know how it turned out! and the recipe sounds divine, I’m going to bookmark it, as my partner adores mushrooms, and the combination with Kale sound delicious. Thank you! I think I will enjoy this next year, and decade. I’m with your partner – just cooked up the last of these shiitakes this morning with my eggs and it made me jump up and down, it was so good. The world would be a darker place without mushrooms. Nice photos, Jenni! I am going to try a version of this salad tonight or tomorrow. I don’t have shitake mushrooms so will try good old baby bellas, and hopefully have similar results. Thanks! Did you have a chance to try it, Lynda? Hope the baby bellas worked, or that you had them in something equally delicious (which you always do!). This salad is right up my alley – so many favorite flavors here. Thank you for sharing it, and your gorgeous photos! Happy 40th birthday! You’re in for a treat – so far my early 40s have been the best years ever. Yea for a new decade! So many women I know have said the same thing. I’m glad to be at the 40’s party. Thank you for your kind words about my photos. I hope the salad tastes as good when you make it yourself. Thanks so much for visiting! 1milagritos: Oh, no! The best laid plans…ah, well. Hope you’re able to try it tomorrow! Love your photos! I’m starving now! So glad to have found your blog, it’s beautiful! I’m allergic to soy, so I’m going to try this recipe with balsamic vinegar and a bit of fish sauce for the salty element…I’ll let you know how it turns out! Thank you, Liz! I’m so glad to have found your shingle, too – lovely! Those sound like delicious substitutions. Do let us know how it turns out and thanks so much for visiting! That salad looks amazing, and your photos are stunning! My mouth is watering just looking at them. I wish I could pluck one of those mushrooms right out of the screen and eat it! Thank you, Jessie! Those mushrooms are just about my favorite thing in the world to photograph. I’m so glad you stopped by! I finally got around to making the salad. I used shoyu instead of tamari. And since I did not have any honey right now, I used balsamic vinegar instead of cider vinegar to give it enough sweetness. Oh, and I added some home made veggie broth to the water in which I steamed the chopped kale. I was surprised how good the salad tasted. Thanks for sharing. Those substitutions sound fantastic, Lilly. I’m so glad you enjoyed it! Now I kind of want to make it again myself, even though it is late… Thank you for visiting! 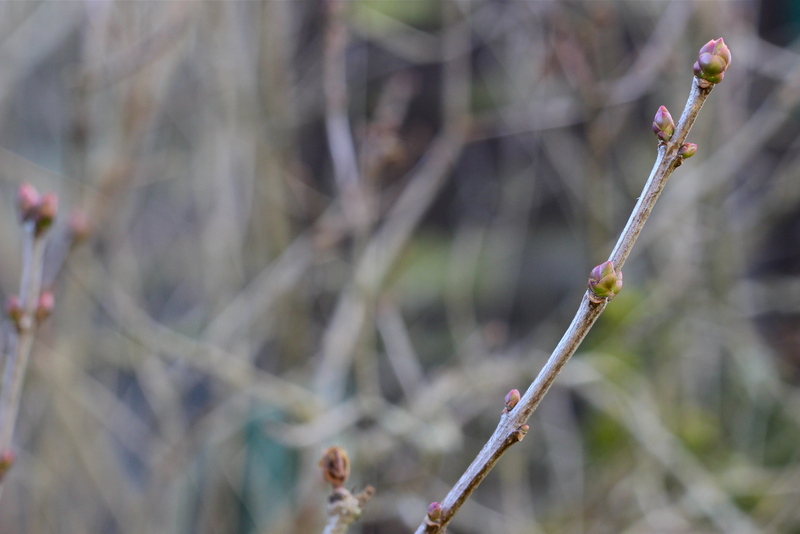 Thanks so much for stopping by my blog! This recipe is really exciting as I love seaweed salads and have always wanted to make my own. 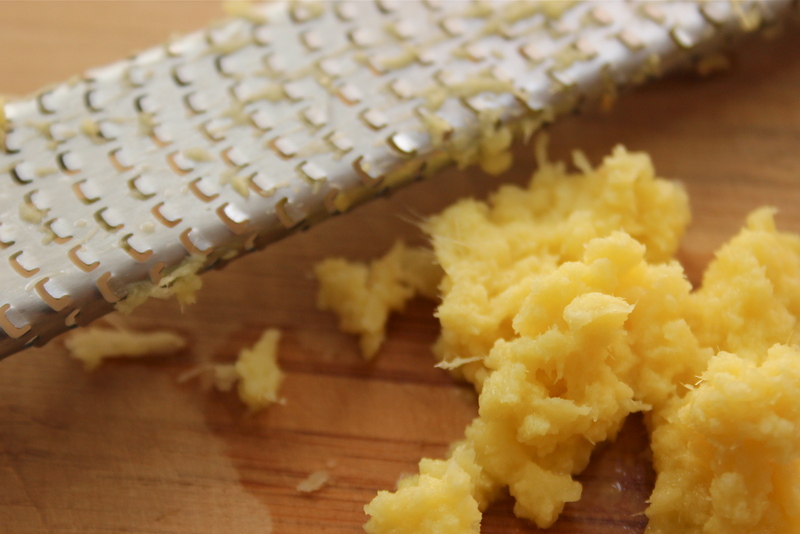 Your food photography is inspiring and I look forward to reading more….And cooking more! Thank you so much, Sarah. I’m glad you stopped by! I’m finding as we do this series that seaweed is simple to cook with – an easy way to get nutrients and flavor, the whole package. Do let me know if you give this one a try. Hmm…I meant to post on the page where your seaweed salad was…not sure what happened?